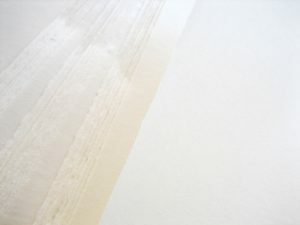 The textures of the materials used, such as paper and silk, are considered to be a part of the expression in Japanese art. We collect and distribute ‘Washi’ in order to please the artists who seek their own ways of expression. It is very difficult for artists to use a new type of ‘Washi’, but we enjoy every piece of work that they explore. We believe that there is a ‘Washi’ for every kind of expression, and we also enjoy the process of figuring out the best match between the paper and the artist. We hope that one day we will manage to make an order made ‘Washi’ for every artist. Formerly, ‘Washi’ was called Japanese paper (Wagami). It is strong, thin, and flexible. Hand-made washi is made individually from plant fibers, mainly Kouzo, Mitsumata, Gannpi, in a place where there is clean water. There is no distinct difference between Washi and Youshi. The Western skills were brought into Japan in the beginning of the Meji Era. Paper produced in Japan around this period were made one-by-one from fibers such as Kouzo (mulberry fiber), Mitsumata (paperbush), and Gannpi. Then the western skills of paper making using machines were introduced. To distingush paper produced by these different techniques, the machine-made paper using woody pulp was called ‘Youshi’ and paper made by traditional techniquess was called ‘Washi’. These days, there is Washi produced by machines, and Washi mixed with pulp which makes it more difficult to define ‘Washi’. *Sukiwa only uses hand made Washi using traditional methods and materials. Most of the paper used in our daily lives (news paper, books and notebooks, etc) are mostly paper produced with machines. The benefit of making paper with a machine is that mass production is possible and that the quality is even. For print paper, the evenness is crucial and therefore machine production is suited. Nowdays, it is possible to make ‘Kouzo’ mulberry fiber into paper with a machine, which can look similar to hand-made paper even if it is made with a machine. However still, there are qualities in hand-made paper, such as its strength, quality and texture, which cannot be copied by machines. Each paper made by skilled papermakers has their own distinct character. You harvest ‘Kouzo’ in the winter. ‘Kouzo’ is grown throughout the year and you can harvest it each year. The harvested ‘Kouzo’ is cut into the same length and it is steamed under a steam pot (Mushi-oke). Washi is made from the white part of the plant, and so the black and green parts on the outer layer are carefully peeled off using a knife. The skin of the kouzo plant is laid out on the river edge and the unnecessary parts of the material are washed off. By exposing it to light at the same time, it turns white. The white skin is softened by boiling it in a large pot. With a bamboo sieve placed in the river, you take off the damaged parts or dust from the material. You place the ‘Kouzo’ on a stone base, and weaken the fiber by hitting it with a wooden hammer. With a special technique called ‘Nagashi Suki’, you put water and glue (made from a plant root) in a sieve and combine it with the paper material by shaking the sieve from side to side. You repeat this until the paper is the right thickness. The paper after draining ‘Shito’ is left overnight and is pressed to drain any remaining water. The pressed paper is peeled off one by one and is placed on a drying rack. It is then dried outdoors in the sun. The dried paper is inspected under the sun and is separated according to its thickness, color and texture. The oldest Washi are the Mino, Chikuzen and Buzen Washi stored in Shoso-In in Nara Prefecture. (Shoso-In was an assembly of many storage houses for treasure during the Nara and Heian Era, but there is only one house left today, called the ‘Shoso-In Treasure House’.) These Washi were used as a birth certificate and there is one register dating back to year 702 AD. The reason for this lies in the fiber of the plant. 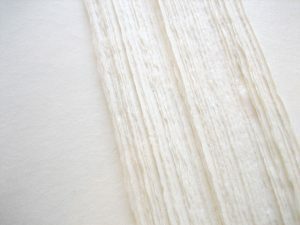 Artificial fiber and rayon or animal hair pressed together do not come together into a single sheet, but plant fiber has a ‘self-adhering’ quality that makes it stick together into a strong sheet after draining and drying. A ‘self-adhering’ quality is a tendency for the fibers to stick together at points where they overlap. Plant fiber is an assembly of many cellulose molecules, and some parts of the cellulose molecule have a configuration that is similar to a water molecule. This part of the molecule combines well with water and the fiber enlarges as it absorbs water. Through the process of making the plant fiber absorb water, putting it through a sieve, and drying, the fibers formerly attached to water stick together to make a strong piece of paper. The strength of Washi can also be explained by the character of the fiber. Pulp used in western paper is 2.3mm on average for evergreens and 1.02mm for deciduous plants. However, Kouzo used for hand made Washi is 7.3mm, Mitsumata is 3.2mm and Gannpi is 5.0mm in length. And these fibers are especially thin for their lengths. The parts where fibers overlap increases as the length of each fiber increases, which makes a stronger paper. A special glue made from plant roots is used in Washi making. Adding this to the fibers while putting it through a sieve, it evens out the fiber and makes a strong thin paper by enhancing out the quality and strength of the fibers.